Vegan Eats and Treats! : Cauliflower, Sweet Potatoes & More! 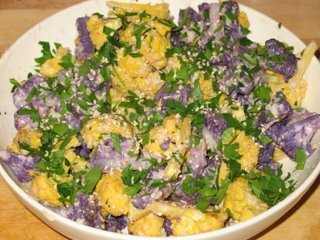 Cauliflower, Sweet Potatoes & More! First, I made the Roasted Cauliflower with Lemon-Tahini Dressing. 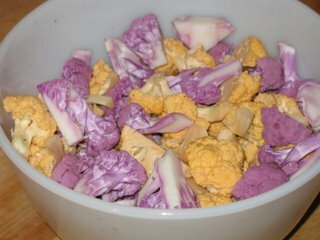 I used my fancy purple and orange cauliflowers. Aren't they beautiful!? Here they are before I roasted them. I thought the roasting would dilute the color, but not at all... So pretty. This is the finished dish (garnished with parseley). I thought the flavor was pretty good, but maybe not my favorite. Maybe I like my cauliflower steamed a bit more than I like it roasted. Still, it's a tasty dish and we've got a fair amount left over for tomorrow. 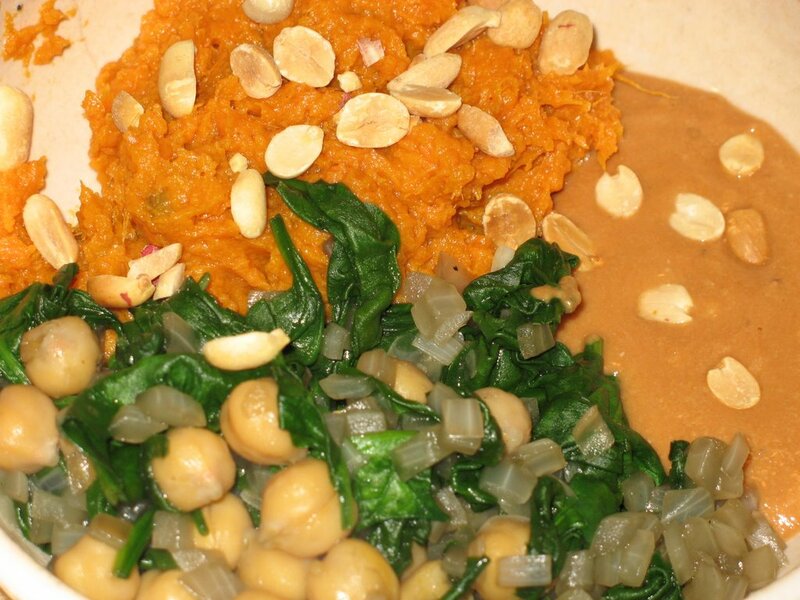 Also I made the "G-nut Sauce with Sweet Potatoes" - a really nice recipe. Baked sweet potatoes mixed with cumin and lemon juice, topped with sauteed onion-garbanzo-spinach mix, and all topped with a special peanut sauce. I'm not usually one for peanut sauce, but this was a nice recipe. I also made it all oil-free. Great success! Even Musty (aka "sweet potato hater") enjoyed it a lot. hoorah! 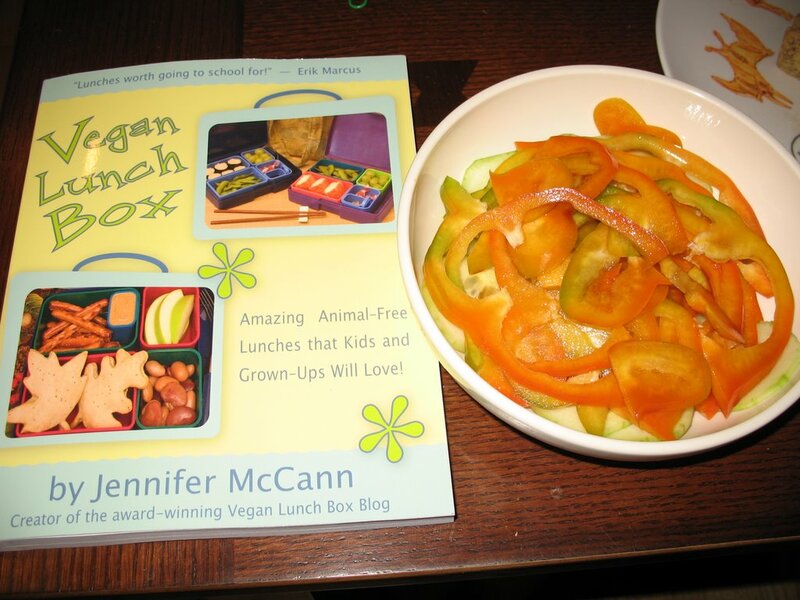 Last night we had left over tofu tart for dinner, but also I made a salad with cucumbers, bell peppers, and onions... More importantly - yesterday I got my autographed copy of "The Vegan Lunchbox" cookbook! Hoorah! I am really excited to read through it some more and try some of the recipes. Finally - I need your help and ideas, fellow vegan bloggers!! On Friday, I am going to have lunch with a man who owns a pretty sizeable sandwich/deli chain in Northern California. We have a few connections in common, and someone mentioned to him that there weren't any good vegan options at his deli. So, we are going to have lunch to discuss some ideas for vegan sandwiches. This is where I need your help! I want to come armed with ideas... they need to be pretty mainstream, basic ingredients, as simple and "normal" as possible. My current thought is to encourage him to have a hummus sandwich (I am thinking of bringing a selection of hummus to our meeting, so he can experience the difference between good, bad, and ho-hum hummuses). But what toppings? Any special ideas? I'd love to hear your thoughts!! The roasted cauliflower looks so delicious. I love the colors together. I'm sorry to hear it didn't taste as good as it looks. On my hummus sandwiches I love sprouts. I also like thick slices of tomato, shredded carrot and shredded cucumber and I usually put a little italian dressing on top of the veggies. Maybe also a sprinkling of nuts (sliced almonds or chopped walnuts). Glad to see the owner is open to suggestions! *** This just added after trying to post this comment for the 4th time now. I swear, sometimes blogger makes me feel so dumb because I can't tell what the letters are (especially when they're all smushed together). Argh! That's cool about the possibility of sandwiches- definitely different kinds of hummus, but maybe something with patties (like bean or lentil patties) for variety. How about just a marinated roasted veggie sandwich? Pesto always kicks everything up a notch... I'd suggest baked tofu sandwiches, but I don't know if that's normal enough... What about wraps? Can you tell I'm excited by this project??! Your cauliflower looks awesome by the way. Thanks for the good ideas, VivV & Bazu! I am going to write them all down so I can come fully armed with ideas and suggestions to see what sounds best to him. ... I'm so grateful for the ideas, already in just two comments there are so many things I didn't think of! ps. VivV, I know what you mean about the weirdo letters. Sometimes they are impossible to decipher! I really like vegan buns or wraps spread with sundried tomato-basil pesto, then filled with marinated and grilled eggplant, zucchini, peppers, onions and seitan. So good! That sounds like a really tasty sandwich! Makes me hungry just reading about it. A hummus sandwich with sprouts, tomatoes, cucumbers, shredded carrots, sunflower seeds, red bell pepper, and maybe avocado. He's going to do some tests and see if he can make something tasty! That sounds like a delicious sandwich - one that I would definitely order. Sorry about the redundancy in my previous post. I should have checked here first.